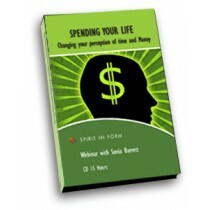 SPENDING YOUR LIFE, Changing your perception of time and Money - 15 HOURS AUDIO! ORDER This was a 6 months’ workshop/course. Since you weren’t able to attend live you can now experience the workshop just as if you had been there. You receive all of the homework/handouts! These workshops are different, intense but fun. This is not light weight content and so it is important that this is made clear. Many references are made to quantum physics and extremely out of the box concepts. This requires an open perception. This involves exercises each month allowing us to step outside of our perception boundaries about the concept of money. Our aim is to move beyond the illusion of coded paper concepts to which we are attached. We are rewiring the brain to begin to allow the unlimited current to be experienced for it already flows. This process aligns with one’s life force and as we step away from the illusion of a finite existence. This will be a profoundly significant workshop in terms of what we will discover about how unlimited we are. The concept of money for many ranges from simple to complex, money is not at all what we have been programmed to accept. This realization is being addressed from a perspective that goes beyond our money programs which have been supported by coded pieces of paper. This coding is so profound that our brains are studied to review our responses to these various increments printed on paper. This coding is so profound that our brains are studied to review our responses to these various increments printed on paper. What we believe to be a scarce supply is just the opposite but through these cleverly imposed belief systems not only do we pursue this thing we call “money” based on beliefs and perceptions but we will give our life for it! We are chasing an illusion! Money represents the current moving through the giving and receiving process. It is energy moving in response to our external and internal programs. You can’t make money but you can print a concept on paper…the trick of the magician! The mind is also fooled with digital coding as is used in our banking system. We ascribe to limiting coded increments as presented to our minds by the third dimensional game system. What we interact with is the idea of money based on a set of rules, boundaries and concepts buried in programs. We unwittingly become hypnotized by the money game. The monetary game program is so woven into our minds that no effort is needed in maintaining this illusion.